GRAND RAPIDS, MI — Metro Health: University of Michigan Health is looking to expand its reach in the Alger Heights neighborhood as plans move forward for a new medical office. The Wyoming-based local health system recently finalized its affiliation with the University of Michigan Health System this month. The Wyoming-based hospital is becoming a wholly-owned subsidiary of Ann Arbor’s university-owned health care system. 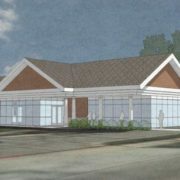 The new Alger Heights office will offer primary care, and is planning to develop a new building at 2550 Eastern Ave. SE on a two-acre property south of the Tabernacle Community Church. Tabernacle Community Church acquired the property in 2007 when Evergreen Christian School moved out, said Pastor Artie Lindsay. Shortly after that, the mechanical systems failed in the building at the corner of Eastern and Mahew Wood Drive — and it has been vacant since 2008. The building will be torn down. Proposed is a new, one-story, 15,800-gross-square-foot building that would mimic many of the existing features of the former school. A 64-space parking lot is also proposed, with access only off of Eastern Avenue. Access to the property now off of Nevada Street will be closed off. The new building would allow Metro Health to expand its reach in the Alger Heights neighborhood, as it is planning to move its existing operations from Alger Street into the new facility when it opens in 2018. Staffing levels for the office have yet to be set in stone, but Metro Health officials anticipate there will be three to four doctors at the office with physician assistants and medical assistants as well. Services will include primary care, physical therapy, lab and radiology service as well as some rotating specialists. The new Alger Heights office may include different scheduling that’s more flexible and responsive to patient needs, according to Metro Health officials. That could include telemedicine capabilities and specialty consultant evaluations. Metro Health is working with Pinnacle Ventures on the project. An existing playground will be relocated to the church property, and a community garden will remain. The church is in the process of selling off the two-acre piece of the property to Pinnacle Construction, which will build the new office facility and rent it out to Metro Health. The project was in front of the Grand Rapids Planning Commission this month with a rezoning request from low-density residential to a special district for neighborhood offices. The planning commission gave its approval, but a full City Commission vote is needed in order for it to take effect. Metro Health has more than 500 doctors on staff and a 208-bed hospital, as well as a number of neighborhood outpatient centers and offices in West Michigan. It also has a community clinic for under-served populations as well as a student health clinic at Grand Valley State University.